Enhance your computer with the Dual-Band Wireless-N Express Card and experience the freedom and convenience of flexible, fast, wide-range wireless connectivity for your laptop. Easy Setup, Get connected quickly. Slides into your laptop’s ExpressCard slot. Step-by-step Setup Wizard makes it easy to configure to your network’s settings. Dual Band Wireless-N connectivity for your laptop; ExpressCard slot installation. Convenient flexibility – connect on either 2.4 GHz or 5 GHz bands. 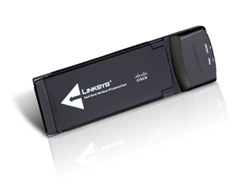 Linksys WEC600N ExpressCard is based on the Broadcom BCM43xx chipset.